Defense Workers Lobby To Prevent Cuts Even as Congress' deficit-reduction supercommittee ran into a dead end this week, the resulting mandatory spending cuts were immediately targeted by interest groups and sympathetic lawmakers. No interest group stands to lose more than the defense industry. 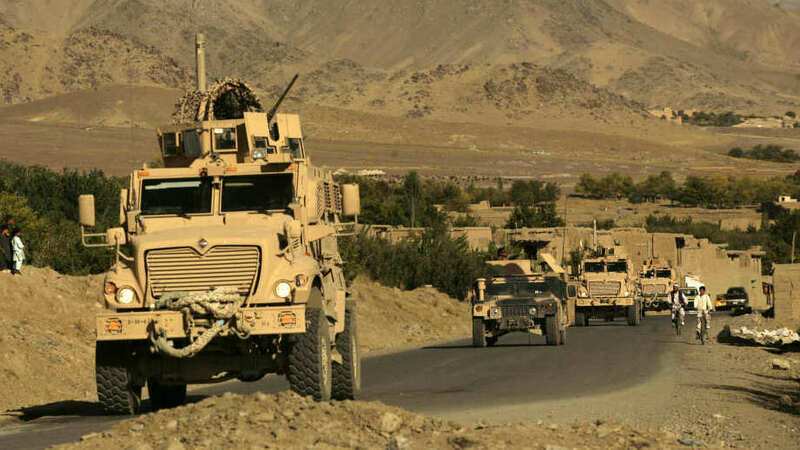 U.S. Army mine-resistant armored vehicles (MRAPs) and Afghan National Army vehicles pass through a village during a joint patrol in the Jalrez Valley in Afghanistan's Wardak province. On Monday, factory workers who produce MRAPs in York, Pa., rallied to protect the Pentagon budget against the automatic budget cuts that will take effect in 2013. The supercommittee's failure puts in motion automatic budget cuts for the Pentagon of $600 billion — a process called sequestration. On Monday, even before the supercommittee flamed out, defense workers in York, Pa., rallied to protect the Pentagon budget and perhaps their own jobs. The local congressman, Republican Todd Platts, spoke to the workers and said that Republicans and Democrats in Congress should also do their work as Americans. "When you get on this assembly line and you start building these amazing products that save the lives of courageous Americans in harm's way, you do it as Americans," Platts says. The York factory is owned by BAE Systems. Mostly, it makes and refits Bradley Fighting Vehicles and the mine-resistant ambush protected trucks called MRAPs. The rally in York was not spontaneous. It was part of a lobbying campaign run by the Aerospace Industries Association, the trade group for the big defense contractors. The association's president, Marion Blakey, addressed the factory workers. In an interview with NPR, she said the campaign is called "Second To None," because America should always give its military the best. These contractors just don't want their pipelines reduced or the numbers of copies of weapons reduced so that their profits stay high. "Night-vision goggles, unmanned systems, the helicopter that went in to take out Osama bin Laden — all that is the product of real [research and development]" that would be crippled by the coming cuts, she says, unless Congress is persuaded to act. "You know, there's no substitute for grass-roots activity, letter-writing, meeting with members, going to rallies," Blakey says. "And that is what the defense industry is initiating with the 'Second To None' campaign." If the automatic cuts take effect, the industry predicts 1 million jobs lost and ground forces shrunk to pre-World War II levels. "These contractors just don't want their pipelines reduced or the numbers of copies of weapons reduced so that their profits stay high," says Stan Collender, a Washington analyst with long experience dissecting budgets and lobbying campaigns. "Certainly if there's any kind of a military threat to the country between now and when the cuts will take place, they will use that as reasoning not to let these cuts take effect," Collender says. But it's not even clear that the defense contractors know how to run this kind of broad grass-roots effort. Michael Herson, president of the lobbying firm American Defense International, counts some well-known contractors among its clients. Herson says the industry has a long way to go before it can match the clout of the seniors' lobby AARP. "If you turn on the TV and you see a commercial that's paid for by AARP, it's meant to scare you," Herson says. "That ... 'We can't cut Social Security and Medicare,' because it's going to hurt seniors, and they vote." And he says that for years now, defense contractors have only worried about their own products, which he calls their "pet rocks." "The defense industry does not have a history of working together to lobby for what we call the top line — how much we can spend on defense," Herson says. "They have a history of working to protect their pet rocks." The budget timetable could work against the industry, as well. Sequestration isn't due to start until 2013. But Herson points out that planning for the 2013 budget starts this coming February. If the automatic cuts get written into early budget drafts, it may be tough to undo them.